You’ve designed a handbag collection … Now what? Consumers are shaking off the recession as per capita disposable income grows, indulging in frivolous purchases again and traveling–with new bags and luggage to jetset in style. Great time to start a handbag company of your own. This global exhaling brought the world market for handbags to $101 billion. Stateside, the U.S. market for handbags, luggage, and accessories climbed to $9.6 billion, up 3.3% annually from the five years to 2014. The U.S. handbag market is expected to reach $11.8 billion by 2019, increasing 4.3% year-over-year. Strong growth is being seen in men’s bags. Male gender norms are softening, allowing American men to follow their European counterparts and carry bags without fear of being mocked. This sociological allowance has allowed the men’s bag market to explode, with male bag purchases increasing 26% in the last year. Starting a handbag business is more than just creating amazing and stylish bags. You’ll need to understand the operations of a dynamic fashion industry and how your new handbag brand will expand and thrive in the future. 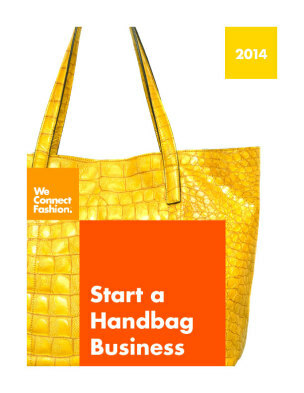 Start an Handbags Business is built by industry experts who have been there, done that. This How-To PDF publication is designed to help you plan your company, produce your product, promote your brand, and sell to buyers.